Gathering Instructors - In no particular order. Each year will bring some returning instructors and some new ones will join us. This page is to introduce you to all of our dedicated teachers who travel from far and wide to make the gathering a success! If you are interested in being an instructor please scroll to the bottom of the page for contact details. Albert is a long-time teacher of the old ways and hails from Phoenix, AZ where he retired from a career with EMS. A practitioner of the fiber arts, he teaches backstrap weaving techniques that he learned from Native weavers in South America, and he also teaches knotless netted bags, Peruvian Rep Braiding, and other fiber arts. Mike hails from Malad, ID where he resides with his wife, Rosemary and their Navajo Churro sheep. He will be guiding students in the use of old fashioned tools to construct rustic furniture from cordwood. He will also be teaching how to tap trees and make syrup from the sap, and natural beekeeping. Karie is a long-time practitioner and teacher of primitive skills. She has taught wilderness and self-reliant skills at Inner Pathworks School and a variety of other skills gatherings, such as Wintercount, Rabbitstick, Between the Rivers and Saskatoon Circle. 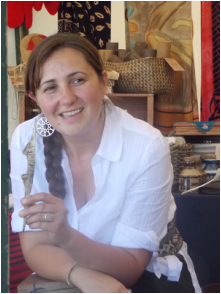 Even though she practices many of the skills in her daily home life, she focuses on teaching brain tanning, buckskin sewing, beading, awareness skills, herbology, and energy medicine. Her passion is to bring forth the spiritual aspects of the ancestral skills and the Art of Sacred Living. Dale 'Blond Bear' Coleman is one of the founders of Echoes in Time Gathering in Salem, Oregon each July. He is well-versed in primitive skills and historical reenacting of the western fur trade. He comes to teach and share some of the skills that cross both worlds including wolf-eared hats, Saami Buckskin bags, housewife, and stone bowls using pecking and grinding! Follow his latest project here. Hal hails from Spring City, Utah where he is finishing up a log cabin. He is making the trek north this spring to teach several ancient and very necessary arts. His skills include friction fire and Southeastern Soft-soled moccasins & other footwear. David is one of the men responisble for much of the modern momentum of primitive skills, and is the owner of Backtracks, the company that sponsors Rabbitstick, Wintercount and Woodsmoke gatherings, from which most of the other gatherings around have sprung. He is a man of many skills, and he shared a few of them with us at Between the Rivers in 2013 including stone and bonework, cordage, adhesives, gourd fishing boxes, and more! Rick is a wealth of knowledge in historic skills and self-sufficiency, and he lives what he teaches. He is joining us to teach the art of book binding - the real deal. He has years of experience reenacting history, especially the years of the American fur trade. Jim is joining us in 2014 and bringing a range of skills including Flintknapping, Traps & Snares and AtlAtl and Dart use. Jim brings a lot of knowledge with him from years of primitive skills and historical reenacting. He is also a skilled kayaker, hunter and forager! Nicole Apelian is a researcher and the CEO and primary guide for her company Eco Tours International, which specializes in tracking and wildlife safaris in Southern Africa. She is also an instructor and graduate advisor for Prescott College and holds a MS in Biology and a PhD focused in Cultural Anthropology and Sustainability Education. Nicole's experience in scientific research is distinguished and her background in biology, anthropology, and real-world experience with global issues adds an unparalleled legitimacy to guiding and leading workshop and safari participants. Nicole is currently engaged in an ethnobotanical study on how the Bushmen utilize the plants of the Kalahari Basin. She also teaches traditional skills and is using her unique cultural experiences as a leader in the field of transformative education. You can reach Nicole at nicole.apelian@gmail.com or visit her website at www.ecotoursinternational.com and join her in the Kalahari. Randy teaches native awareness and nature connection, and he leads a gratitude ceremony every morning before breakfast for those willing to join him. He directs a self-discovery school in Coeur d’Alene, Idaho for young adults. He has spent a lifetime participating and teaching camp craft, pioneering and wilderness survival skills. Check out Randy's work at Soulore. Shaun has been practicing primitive skills and living history for years and has become proficient in many of the old skills including hide tanning, blacksmithing, and tracking and trapping. He is also into historical trekking, has all the gear and accoutrements from the early 1800's, and will be demonstrating and teaching fur trade life and camp skills. Peruse his etsy store here. Antler Mike Goot has a love for the Atl Atl and Dart and all things primitive, and is especially crazy about...Antlers! He is also an avid nature lover, woods wanderer, tree hugger and loving husband, not always in that order. He is especially enthusiastic in the evening at raffle time - if you need tickets, he's got 'em! Ray is a one of a kind musician, singer and instrument builder and is the designer of the Rocky Mountain Dulcimer. He and his wife, Shirley, travel the West teaching classes in how to build and how to play the Rocky Mountain Dulcimer, and we are lucky enough to have them coming to Between the Rivers Gathering. Jean is a one-of-a-kind multi-talented lady! She has been dedicated to our children's program for several years and does a great job teaching the skills and games of our ancestors to our young ones. She is a volunteer with our local radio station, KCHW, and is an avid musician, singer and guitar player. This year she has some special tricks up her sleeves for the young'uns! Hazen has a broad range of primitive skills that he has cultured for over 25 years of practical travel and living among Native peoples around the globe. If given the raw materials, there isn't much of anything he can't make. 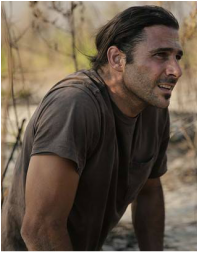 Lately he has been able to show his skills and his comfort in harsh regions with a broad range of people as the host of the television shows, "Survive the Tribe" and "Primal Survivor" on the National Geographic Channel. Hazen will be teaching useful knots and will also be doing a presentation for us on his global travels and work with indigenous peoples. George has been around for a long time, and has a wealth of experience running traplines in wintertime by dog sled and tanning everything from mice to buffalo. 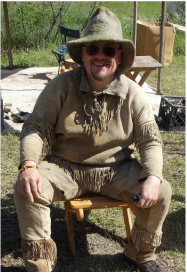 He is joining us from Driggs, ID, and plans to teach fur brain tanning, and sewing of small buckskin items. George also makes and lives in his own Tipis. You may recognize him; he was featured for a season on the television show, "Mountain Men". Bradley is an Eastern Oregon resident, he has been interested in primitive skills since childhood. Hugely influenced by Mr. Jim Riggs, he has been immersed in a variety of skills since 1994. His senior thesis was on primitive skills. He has degrees in Anthropology, Sociology, and Geology. His expertise is too vast to be limited, if you have a question about anything pertaining to primitive skills, he more than likely has an answer, or at the very least a suggestion on how to achieve it. Need to find him? Check the knapping pit. ​Drea has been a student of the outdoors her entire life, and she brings that knowledge and enthusiasm for nature, the old ways and teaching children to Between the Rivers Gathering. She is one of the amazing people who make the Children's Program at BtR such a success! ​Adam is a valued member of our staff, and if you have navigated our camp at night by the beautiful torch and lamp light, you have Adam to thank for it. He is our Lamplighter! He is also a huge supporter of what we do at Between the Rivers, and to show that support, he offers a scholarship opportunity for full tuition to one participant each year who needs to attend, but has difficulty achieving the tuition cost. If you are interested in applying for the Lamplighter Scholarship this year please email Adam at fulywobb@hotmail.com to request an application. We are pleased to welcome Melvin who was recently honored in the Montana Circle of American Masters. Jackie Bread, a Blackfeet beadworker and MCAM artist from Great Falls who nominated Melvin Beattie, points out that he has a wealth of knowledge surrounding a component of Montana's cultural past - the era of the mountain men, a tradition carried forward in today's trapping culture. "He shares his knowledge and art generously, and is one-of-a-kind, a true Montana cultural gem," she says. ​Besides being a ski bum in the winter, He has been the lead instructor for Northwest School of Survival for 10 years, professional ski patrol and avalanche control/forecaster for 10 years, he was a whitewater raft guide for 25 years, and is a natural born hillbilly! At BtR Ed will be focusing on Woodsy Wisdom for Wilderness Wanderers teaching the skills folks need to have the confidence to get out and really experience the environment safely and competently. Hi, my name is Nick! I’m an avid archer and bowyer and absolutely love archery in all its forms. One of my dreams is to teach everyone the value of archery and the lessons that can be learned. I spend a lot of time teaching others to make their own archery equipment. I have a few books out on building bows as well as some videos on Youtube all about making your own bows and other archery tackle. I try a little bit of everything but my favorite bows are short, lighter weight recurves. There is just something about them that makes them fun to shoot and their small size usually means less handshock even at higher weights. For me there is nothing quite like a short bow with a smooth draw and good speed. Ania Palinska is a mama of two wild ones, an artist and a crafter whose approach to art and life is to work with what you've got. She has been practicing ancestral skill since 2012, though she's been curious about ancestral and preindustrial ways of being since she was a child. She resides in the beautiful Methow Valley where she divides her time and energy between work and play, while attempting to live in such a way where she cannot distinguish between the two. The practices of Yoga & Qi Gong are traditional movements that date back at least 5,000 years. These movements were ways that people learned to care for their body, mind, and spirit. Amber has been studying yoga since 1986, and has joyfully taught throughout the Northwest since 2011. She is a Native Montanan of Ojibwa heritage and has spent her life weaving in and out of the holistic healing field. In addition to yoga, her studies include Reiki, Qi Gong, Chinese Meridian Therapy, Sound Healing and Meditation. Amber has received numerous yoga trainings in a variety of styles: Ashtanga Yoga, Vinyasa Yoga, Kundalini Yoga, Hatha Yoga, Restorative Yoga, Yin Yoga and Prenatal Yoga are among the yoga styles she shares with her students. Amber’s greatest joys are to explore the body thru movement, enjoy the great wilderness of our home with her family, and mother her two beautiful boys. She loves helping people of all ages and abilities weave yoga into their joyful journey of life. Kevin is a Northwest local who loves to spend his time in the outdoors. Kevin is also passionate about knives and bladesmithing and he will be teaching bladesmithing at this year's gathering, and walking students through the entire knifemaking process. and adults in ancestral skills since 2005 in a variety of different ecosystems from the Ozarks, Azores, and the Rocky Mtns. He has designed and coordinated nature awareness and ancestral skills programs with Twin Eagles Wilderness School, Ozark Tracker Society and enjoys sharing his passion of the wilds with whomever he shall be sitting around the fire with. A builder of shelters, lover of life, singer of songs and a gifted storyteller who calls the Priest River watershed of Northern Idaho home. Tom started his teaching career at the age of 13 at scout camp through swimming. He was a canoe guide and taught wilderness skills with the Boy Scouts of America for 60 years. Tom worked as a United States Air Force Survival Instructor at Ely and Quetico from 1968-1988. A retired Air Force Tech Sergeant, Lutyens spent the last eight of his 20 year military hitch as a survival instructor in Alaska, training air crews how to protect themselves if they crashed in the arctic.He worked as a contractor for Survival, Evasion, Resistance and Escape school at Fairchild Air Force Base and also as an instructor for Alaska Search and Rescue/Emergency Response. He has assisted with many outdoor program groups as a mentor and continues to learn new ideas with younger outdoor folks. He says he will keep going as long as God allows. As a young lad Ford despised boy scouts and camping but then after a series of strange events possibly related to aliens, his heart changed. Ford went on to work at the Anasazi Foundation as a backcountry guide and primitive skills instructor to at risk youth and young adults. He also has been an instructor for the teens at Rabbitstick gathering in Idaho. Ford’s other interests include shredding on guitar in a touring rock opera, making strange youtube videos (https://www.youtube.com/user/FordThunderErickson), Taco Bell, donuts, pizza, eggo waffles, talking to Clutch Lambert, and eating donuts with Clutch Lambert. Meg is a lifelong student and outdoors enthusiast, Meg hails from the forests of Virginia. Currently residing in Tucson Arizona, she works for the Anasazi Foundation as trail staff and spends the rest of her time learning new skills, painting, and petting cats. ​Terry has been instructing at skills gatherings for many years and is proficient at many skills. He plans to share a few with us this year including flintknapping and woodcarving. Mark is an artist and an environmental consultant, a maker, by inclination and by pursuit. He works mainly as a sculptor of stone, wood and steel. He also creates paintings based on petroglyphs. He came into the primitive skills community through the Anasazi Foundation. He has taught at Rabbit Stick, Winter Count and Elements gatherings. He will be teaching stone pendant making from soft stones, soapstone fetish carving and pictograph painting. As an overall philosophy of life, Mark believes in having fun and sharing it with others. He believes that we are here on this wonderful blue marble whirling through space to learn from each other and learn to love our fellow travelers. Tamara became fascinated by ancient living skills in 1989 when she attended the Glass Buttes Knap In and Rabbitstick Skills Gathering. She was "hooked" and quickly began incorporating the practice of skills into her daily experience. Ever since, she has been dedicating her life to enjoying, learning, researching, experimenting with, writing about and teaching Paleo Technologies through a variety of programs, workshops & demonstrations on a range of skill topics at a plethora of locations through her company Paleotechnics: Arts & Technologies of Earth Peoples. Her main offerings are Ancient Living Skills Overview Programs for grade schools and home school groups all around Northern California, and also as part of longer adult programs such as the Occidental Arts & Ecology Center's Permaculture Design Course and the California School of Herbal Studies' Roots of Herbalism / Foundations of Health Course. A co-author of the book Buckskin: The Ancient Art of Braintanning, the handbooks "So You Have a Dead Animal", "Sharpening", "Sustainable Harvest" & "Using the Whole Animal" and numerous chapters in books Woodsmoke, Primitive Technology 1 and Primitive Technology 2, she has long been instructing at Ancestral Living Skills events around the western states for the past 30 years. Born and raised in Topanga Canyon, Raena Riese has always had a passion for the outdoors. Being homeschooled through her childhood instilled in her a love of all things nature and nurture. She began attending primitive skills gatherings at age 13 and has been hooked ever since. Raena currently teaches kid yoga, animal husbandry and plant identification/medicinal uses at a nature connection based preschool in Topanga. Her biggest passion is learning through nature with her students while guiding them to their innate knowledge of these skills through deep nature connection, playing games, dancing, silent time and drawing. Outside of her time with kids, her current obsession is her new drop spindle and learning how to create with it. When she isn’t doing anything listed above she is most likely learning new skills, roadtripping, camping, backpacking, hiking or at the beach. This year at Between the Rivers she will be teaching the 4-7 year old Nature Ninjas in kids camp along with the wonderful Kerri and Amy. Chase got his start in copper and tin smithing a few years ago and was hooked! He was fortunate to learn from the best and seeks to replicate the craftsmanship and quality of his mentor. Chase started teaching copper and tin at primitive skills gatherings and loves to share his hobby with anyone willing to learn. Chase enjoys the challenge and meditative element of the art of tin and copper smithing. He loves to create practical working art and using tools from the 1800’s. Chase enjoys the connection he feels to the past when using the same tools that were used by others over 200 years ago. He plans to teach tin and copper smithing at Between the Rivers this year. ​1) Professional hunting guide - in his late teens he worked as a professional guide, mainly for Sheep and Brown bear, in Alaska - Wrangell Mountains. 4) Flintknapper - proficient and a great instructor, I've knapped with him a lot. 9) Tracking - Expert, better than I and I'm pretty damn good. 10) Cabin Building - Master Builder - A professional builder - Whidbey Custom Homes, currently lives off the grid in a cab he built (small help from yours truly) with his wife of 30 years and 16 year old daughter. 11) Hunter - Professional - with any tool - bows, firearms, traps etc. 12) Story Teller! True life ADVENTURE! And Too many others to enumerate. Scott is committed to leading visionary thought into the world through educational and mentoring solutions that create meaningful impact by bringing about change to the way people view and interact with the world of today. By focusing on the mind and the heart, Wright creates an experience on powerful, unseen principles that underline the human experience and one’s individual capacity for insight into their own unique talents and capacities. Scott is planning to teach classes on mindfulness, and how to use Nature as your guide in life. The setting for this event is a perfect backdrop to experience Mother Nature in all her beauty. His classes incorporate the use of music, smudging, and being present to find your inner guide. Possible topics include, Sacred Plants, Music, Sunflowers, Nature’s Symbolism, and our connection to all that is. Come join and bring your own vision of how you see the World. After returning from Europe in 1970, I made bread on the first day and started learning hand bookbinding on the second day. By 1972 I was off-grid, back to the land, and wanted to study traditional hand methods around the world. The reason I like studying what took humans thousands of years of accumulated knowledge to learn is that it works so well. I teach a class on making a late Medieval book from raw materials in two weeks – make bone tools paper, thread from flax stalk, wooden covers, brass clasps, parchment and leather. Classes for BtR: 1) Making bone tools and objects from deer, elk, and moose bone – bones will be supplied and/or bring your own found bone, antler or horn. 2) Pocket size leather book – paper sections sewn onto full leather with flap. 3) Undecided yet. Kandis currently lives in Colbert, WA and is one of our local primitive skills practitioners and outdoor living enthusiasts. She has picked soft-fiber basketry, stone carving, and beadwork from her many talents and skills to share with us at the gathering. Cat is a well-known herbalist and wild medicine specialist. She has been teaching herbal medicine at gatherings since 1997, and she will guide you through holistic processes of finding and choosing your herbs and learning to make appropriate medicines that are tailor made for your body. Check out her wares on her website here. Bob Kitch is well known around the country for his skill in making and using the ancient weapons system of the Atlatl and Dart. Many have made an Atlatl with Bob and learned to use the technology that brought down the mammoth, and that was still in use until nearly modern times. This weapon has seen a resurgence in popularity in recent times. Bob will be in charge of the ISAC World Atlatl competition at BtR. Shown here teaching a class in the technology of writing, Kamber loves the unique bits of human history that many take for granted. In her classes you will not only learn skills, you will learn the historical context that surrounds that skill and brings it to life. At Between the Rivers she will have a display about spinning and fibers, and will be involved in orchestrating the visiting groups of children from our local schools. Kamber also has an antiques and vintage store in Chewelah, WA - follow her on facebook here. Gayle is a long-time enthusiast and fine human being at primitive skills gatherings around the West. A resident of Washington State, she will be at Between the Rivers Gathering this year teaching students the art of beadwork. Rosemary is accomplished in a myriad of primitive skills and simple living. She has a Master's degree in Clinical Social Work, but at the gathering she will teach Felting (felt-making) from natural wool, and maple tree tapping and syrup making as taught to her by her grandfather from Nova Scotia. She also teaches spinning, food preservation and natural yeast breads. Emil is an avid gardener and homesteader, and has a host of other skills including how to sharpen and use crosscut saws. He is one of the guys that keeps camp running, and he is the camp handyman. Watch for him in the evenings around raffle time for good fundraising fun! Kirby is the Man in Buckskin! He is also a man of many skills, including flintknapping, bow making, leather tanning and use, and more. He is also the author of the young-adult novel, "Grandfather's Cave." This year he will be teaching the art of leather tooling, and he will often be heard singing and playing the guitar. Kirby's literary works and projects can be seen here. Retired State Archaeology for Oregon. Helped run echoes-in-time event for years. Has made replica artifacts covering 14,000 years of Oregon prehistory for a Traveling Museum, now run by Dr. Patrick O'Grady who works for the Oregon State Museum of Anthropology in Eugene. His web site is here. He is the author of a young-adult novel: Diggin' It available on Amazon. If you have questions about archaeology or early technology he can probably help you out. Leah grew up off-grid and after leaving home, finishing college, and starting a family, has returned to a simpler way of life (mixed with some modern conveniences). Leah has a love for gardening and self sufficiency. This year she will teach primitive gardening tools and demonstrate how to make simple cheese and yogurt without the use of electricity. Hailing from North Idaho, Cassie has been learning and teaching skills and nature awareness to all ages for over a decade. When she's not out chasing down that mystery bird song, or hunting whatever herbs are in season, she loves to weave. This year, she will be teaching Adirondack-style pack basket making. Mick is a retired archaeologist and resides in Southwest Washington with his family. He has a passion for modern homesteading, country crafts, and living history. He volunteers at the carpentry shop in Fort Vancouver, (a reconstructed Hudson's Bay trading post), and has taught several classes in bowl turning on a pole lathe. In addition to woodworking Mick has skills in tin and copper smithing. He plans to teach tinsmithing at this year’s gathering. Todd is a Hunter/Gatherer who loves the great outdoors. I hang my hat in Northeastern Wa. I enjoy spending time with family and friends, organic gardening, self sufficiency, angling, traditional archery, and practicing primitive skills. He is one of the core staff that keeps the camp running each year! Jean is a long-time buckskinner and historical reenactor in the Pacific Northwest. She and Rick have a beautiful Tipi and set it up traditionally with all the trimmings. They plan to bring it this year and teach Tipi Living. Jean will also be teaching beadwork in the style of lazy, or lane stitch, which is a historical method for decorating clothing, bags and such. 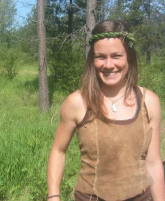 Jessica Spurr is a local wildcrafter, herbalist, permaculturist and teacher. She has been studying plants and their symbiotic relations with humans, other plants and the celestial bodies since 2012. "The deeper into botanical study I go, the more I realize I have to learn, how exciting!" She teaches a range of medicine making workshops as well as orchestrating plant walks. She is also the ship steerer for the Spokane Herbal Faire. (would u be willing to link to the site?) 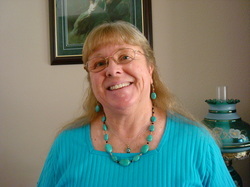 Currently she is working to set up an Herbalists Without Borders clinic in Spokane. She loves her family, plants and singing! Rene' (skeleton lady), has 10 years’ worth of experience in Industrial EMS working in remote locations. She currently resides in Leduc, Alberta, Canada. 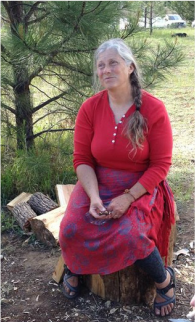 She is a long time participant in gathering and survival courses, and this year she will be teaching silversmithing, casting molten copper and weaving hemp jewelry at Between the Rivers Gathering. Rod has been practicing ancestral skills since he was very young, and he is a highly skilled primitive technologist in many areas including flintknapping, stonework, tool making, primitive pottery, and blacksmithing, to name a few. He currently lives in Boise, ID. He will be teaching primitive pottery at this year's gathering. Goode is a long time primitive skills practitioner, artist, and one of the founders of Echoes in Time Gathering near Salem, OR. There aren't a lot of skills that Goode isn't good at, so if you have a chance, sit down with him and learn whatever he happens to be teaching. He is also an accomplished guitarist - one of several in camp! Vicki learned felt making from Jack Fee over 7 years ago while apprenticing with him for 5 months, and since she has taught felting at Acorn, Elements, Saskatoon, Buckeye, Echoes in Time, Rabbitstick, and Wintercount gatherings, and she holds workshops in felting everywhere. She will be one of our felting instructors this year at Between the Rivers. Katie is a driving force in primitive skills in the Northwest. She is instrumental in making Saskatoon Circle happen every year in September in the Methow Valley, WA. For the past few years she has led Buffalo Bridge in Montana helping traditional hunters to process their kills. She has also spent time teaching people on the Nez Pierce reservation how to make brain tanned buckskin. Katie has a diverse skill set, and we are thrilled that she plans to share some of it with us at this year's gathering! Caren hails from Victoria, BC and has been attending and teaching at primitive skills gatherings for more than 2 decades. She is proficient in a myriad of skills, especially those of the northern forest. At Backtracks gatherings she has most commonly taught birchbark containers, and we presume that she may do that at BtR this year. ​Hari, a longtime primitive enthusiast, is coming from Santa, Idaho where he lives and works in the woods. He will be teaching paddle carving and making diddley bows, a primitive musical instrument from the plantations. He will also share in the Scottish Highland fun. John Huffstutter's Quailside Forge in Chewelah, WA grew from his passion for making "stuff." A change of careers gave him the opportunity to turn an eclectic collection of interests and hobbies into a focused avocation. He has now been blacksmithing for more than ten years, with a focus on traditional styles and methods. He blends smithing with woodworking and his other hobbies to produce attractive and functional items. Blacksmithing is physical, mental, creative and fun... come learn how to use an anvil, a hammer, and a fire to make metal bend to your will. Hilary and Jed live off grid in the forests of Northern Idaho and are both passionate about a variety of primitive living and homestead skills. Jed is a natural builder and craftsman and will be primarily offering classes on primitive shelters and backwoods building skills. Hilary has been teaching primitive skills for the last decade and this year at Between the Rivers will be teaching how to make a variety of primitive containers from bark to buckskin. Pete and Kerri became involved in the traditional skills world while being trail staff at Anasazi Foundation. Pete is a certified in Permaculture, he had studied Western Herbology for many years, has taught traditional woodworking in a middle/elementary school, he is a treasure hunter, he has also been a farmer, and is a proud papa to four boys. Kerri loves long walks on the beach and a good reads, between providing and making home for five boys, that number includes her husband. Jim Langell enjoys fishing and hunting. He is a father and grandfather and loves helping children connect with using bows and arrows. Jim puts a lot of time and effort into making template bows for kids of all ages. 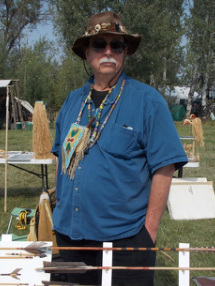 He is an extremely generous man and we are thrilled to have him teach bow making at Between the Rivers Gathering! Daniel is going to light up the night at Between the Rivers with his Torch Making classes. He hails from Corvallis, OR where he runs Coyle Outside providing instruction in wilderness, survival and primitive skills. He also designs and builds bicycle helmets from natural and recycled materials. He has worked as a wilderness guide at Catherine Freer Wilderness Therapy and holds a degree in biology from Cornell University. ​is a student and teacher of ancestral technology, specializing in basketry, bone tools, and friction fire. He is the organizer of Echoes in Time, Oregon's oldest ancestral skills gathering. For as long as he can remember, Larry has enjoyed the outdoors and the solitude it provides. Growing up..., Larry enjoyed hunting, fishing, backpacking and anything else that would allow him to spend time in the woods. After marrying his high school sweetheart at the age of 18, Larry soon switched his focus to starting a family and raising his two kids. Now that his son and daughter have left home, he has refocused his life to the outdoors with a new emphasis on survival and primitive skills. Over the last few years, Larry has taken and taught many survival classes, written articles for a self-reliance magazine, made and uploaded over two hundred YouTube videos. Larry’s videos show case both primitive as well as modern fire, shelter, and water purification. Recently, Larry tested his survival skills as a participant on History’s Alone show. On Vancouver Island he put his skills to the test, self documented his adventure, and survived solo for 64 days. When I asked Barnes what he will be teaching this year at Between the Rivers Gathering next month, he said, “Bison!” “All things Bison.” “I’m gonna team up with Katie and we are gonna teach a bunch of bison stuff, and tan a robe, and make tools, and tail switches, and whatnot.” It sounds good to me! in Canada, and has been to and instructed at Rabbitstick, Wintercount, Winter Camping Symposium, Rat Root, Northern Lights primitive skills gathering, Sundog, Frostbite, and Junior Forest Wardens gatherings. 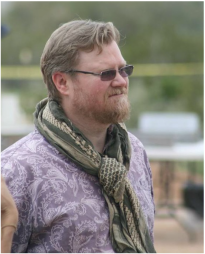 He is currently spearheading the Global Bushcraft Symposium in June of 2019. ​Callie has been on the trail and teaching primitive skills for many years. As far as we know, she and Katie are not related, but they like a lot of the same things. 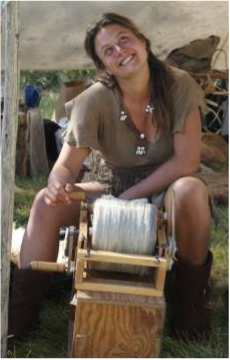 Callie plans to share her knowledge of whole-shoot basketry, rice processing, and wild edibles! Justin and Kylee are our resident Highland Gamers. Justin was mentored by Patrick in his youth and through him learned the love for the outdoors and primitive skills. Kylee would backpack every summer growing up. The two currently compete in Utah Highland Games and have been quickly moving up the ranks. They'll be teaching technique and judging for the Highland Games here at BTR with daily classes to get your skills competition ready. The Schramm's also enjoy hiking and traveling and are excited to be back at Between the Rivers. Paul has been a woodworker all of his adult life. With decades of experience as a primitive bowyer, he has made more than a thousand bows of varying designs, always striving to learn something new each time. Some of his bows can be found in the Traditional Bowyers Bible, as well as in museums. He is passionate about bow making and especially enjoys teaching the skill to others, typically Osage flat bows and Pacific Yew longbows. In addition to teaching, Paul cuts his own trees and sells bow staves to the public. He and his wife Melissa travel in their Gypsy wagon to various primitive skills gatherings in the western states. James has spent over 20 years learning and practicing ancient living skills. From an early age he loved the simplicity and peacefulness of spending time in nature. He currently is a Jr. High history teacher in the Spokane area. He holds a Master’s degree in Outdoor Education and has a passion to connect young and old with the never ending adventure that follows those individuals that seek a relationship with nature. He has worked as a backpacking guide in Yosemite N.P., taught survival skills at various events and programs and has been invited to lecture at different venues on topics ranging from primitive skills to cast iron cooking. He is a top ranked Atlatl thrower and some of his other specialties include brain tanning, friction fire, wool blankets, vintage cast iron identification and bird language. For the past few decades, Finisia lived on "the Hoop," a nomadic lifestyle traditionally practiced by Native Americans and now known to only a few. She moved seasonally by horse and taught her skills and shared her knowledge with many interested students. The Hoop is a relic yet it represents what might be the only truly sustainable way for humans to live on the earth. In the spring is fresh grass for horses, greens and first roots for people. Summer brings stonefruits in the valleys and berries up in the hills. Later summer into autumn seeds ripen and are collected for planting back along the life giving hoop. Winter sets the tone for creating, mending and dreaming. At the heart of a Hoop-centered lifestyle is giving back, planting with active intention for an abundant future and -- in these modern times -- to subvert the decaying technological society. During the past decade, Finisia has opened the bundle that is herself: her intimate knowledge and experience with the indigenous first foods and the practical awareness of how to walk a life based around their success. She has been sharing this with all those she connects with. Adam hails from Rexburg Idaho, just a few miles from the site of Rabbistick. When he’s not making pottery or books or fire or spoons or building houses, he’s studying as an art student at Utah State. He fell in love with the quiet elegance of primitive skills while walking with the Anasazi Foundation, but has always had an incessant curiosity about the natural world. This will be his first year at BTR. Former USMC Officer with extensive World Travel with exposure to primitive people and technology, James grew up in the outdoors, hunting, fishing, trapping, camping and exploring. I was strongly influence by the book Outdoor Survival Skills by the late Larry Dean Olsen who I had the good fortune to meet in 1972. He inspired me to learn all I could about Wilderness Survival and Primitive Skill. James has taken several survival training courses including Jungle Survival in the Philippines and Cold Weather Survival in Japan. A Certified Instructor in First Aid/CPR/AED and Wilderness and Remote First Aid, James is also a Chief Hunter Safety Instructor for the Washington DFW. James hosts numerous Primitive, Traditional and Bushcraft Skills Workshops at his shop in Sammamish, WA and hosts the Annual Sammamish Knap-in of the Puget Sound Knappers. He teaches Flintknapping, traditional glue making (pine pitch/hide/birch bark glue) and PVC bows and is available to assist it many other skills. You can find out more about James by visiting http://pugetsoundknappers.com/events.html and checking out the numerous workshops he hosts at his shop in Sammamish. Paul has been an avid outdoorsman all his life. Spending most of his life in Southeast Idaho and Bear Lake County he gained an appreciation for all things in Nature and a close relationship to Native American Traditions. He has experienced much in life, as an avid hunter and outdoorsman. He was a hunting guide and worked in taxidermy for several years. Due in his interest in History and Culture he was the President of the Upper Snake River Valley historical society and served on the board for 5 years. His interest in the art of Flint Knapping began when he met Dave Wescott and started attending the Rabbit Stick gatherings in 1995. Since then he has honed his skills and freely shared his experience with those around him. His work can be found all over the west in stores and homes. He has an affinity for working with Stones, as he would say “I like to play with Rocks” and has produced some beautiful work with Fire Opals from the mine in Spencer, Idaho. He has developed the skill of wire wrapping stones and jewelry, as well as setting his stones in silver and gold for rings, earrings, pendants, etc. His magnetic personality and jovial persona draw others to him in a very natural way. He has the “gift of gab” as some would say, and is a great person to get to know around a fire. He and his brother Scott open their camp to anyone to join in an evening of conversation and music as part of connecting to each other, and inviting others to join. He is affectionately know as “Pauli Lama” because of his clear way of seeing and expressing himself. I’ve always been making things. I felt the back to the land movement of the 60’s and 70’s gave me the inspiration and the far flung supportive community to explore alterations to my earlier life. Necessity is a great motivator. I acquired skills in gardening, wildcrafting, basketmaking, sewing, fiber arts for yarn and so on. I’ve lived in Santa, Idaho, Northern Panhandle for the last 42 years enjoying the good life with Jim Croft. Classes I’ll teach: 1) Small cedar bark basket. 2) Splitting roots or using rattan to make a small strainer. 3) Making or reading a grafted pattern to use in a crocheted project. 4) Drop-spinning Wool. It is important for our Instructors to know what to expect and to be prepared for a successful event. Instructor spaces are limited at this event and are pre-arranged because we are trying to provide a wide array of classes while avoiding too much class subject duplication. We wish to have the basics covered and still have a good variety of subjects & skill levels. Instructors who have taught a subject in previous years will have preference. ​Please do not show up at the gate with no prior communication with us and expect to be an instructor. Practical skills (hard skills) are the emphasis at this gathering. We believe that awareness is fantastic, and we desire to take people to the next level of competence and confidence in primitive skills, survival, wilderness and homestead basics, and the fine-arts of outdoor living. If you are an interested primitive skills instructor please email Patrick at patrickf@bridgestothepast.org for more info, or call 509-936-1599. We will email or snail mail an instructor packet to you with detailed information. (email preferred) We will confirm your acceptance as an instructor prior to the event start date. You will not be able to show up at the gate and have instructor status without prior contact and approval! Instructors who have already confirmed attendance - please email Patrick your Bio Info & a photo of yourself for inclusion on the website if you haven't done so already. Thanks!